Օգոստոսի 22-ին Ֆրանսիայի և Բրիտանիայի հետ քննարկումները կասեցնելուց մեկ օր անց Մոսկվան հայտարարեց, որ Ռիբենտրոպը պետք է ժամանի Մոսկվա հաջորդ օրը: Սա տեղի ունեցավ երբ Բրիտանիայի և Ֆրանսիայի պատվիրակությունները դեռ Մոսկվայում էին: Քանի որ Արևմտյան տերությունները չէին ցանկանում բավարարել Մոսվայի պահանջները, Ստալինը միանգամից որոշեց կենտրոնանալ գերմանա-խորհրդային գաղտնի պայմանագրի վրա: Օգոստոսի 24-ին ստորագրվեց չհարձակման պայմանագիր, որը ներառում էր, որ յուրաքանչյուր կողմ կարող է պատասխանատվության ենթարկվել այն խտելու համար, չեզոքություն պահպաներ, եթե մյուս կողմը պատերազմի մեջ մտնի երրորդ կողմի հետ, չանդամագրվեր որևէ խմբին, որը ուղղակի կամ անուղղակի վտանգ էր ներկայացնում մյուս կողմի համար: 1939 թվականի օգոստոսի 21-ի Իզվեստիա թերթի «Խորհրդա-գերմանական հարաբերություններ» հոդվածում գրված էր. Լեհական Կրեսի խորհրդային բանակի ներխուժումից տասնմեկ օր հետո Մոլոտով-Ռիբենտրոպ պակտը թարմացվեց Խորհրդա-գերմանական բարեկամության, համագործակցության և ժողովրդավարական պայմանագրով, որով Գերմանիային տրվեց Լեհաստանում ավելի շատ տարածքներ, փոխարենը Լիտվայի տարածքը (բացառությամբ Շեշուպե գետի ձախ ափի) Գերմանիայի ազդեցության շրջանակից անցավ ԽՍՀՄ-ին: 1939 թվականի սեպտեմբերի 28-ին ՊՍՀՄ-ը և Գերմանիան միասին հայտարարեցին. 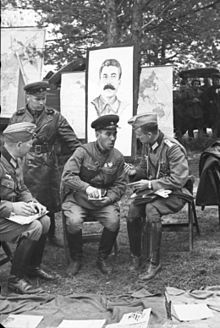 ↑ «Peace Treaty of Brest-Litovsk»։ BYU։ 3 March 1918 . ↑ «German–Russian agreement»։ Rapallo: Mt Holyoke։ 16 April 1922 . ↑ «Treaty of Berlin Between the Soviet Union and Germany»։ Yale։ 24 April 1926 . ↑ Lee Stephen J, Paul Shuter (1996)։ Weimar and Nazi Germany։ Heinemann։ էջ 33։ ISBN 0-435-30920-X . ↑ Müller Rolf-Dieter, Ueberschär Gerd R (2002)։ Hitler's War in the East, 1941–1945: A Critical Assessment։ Berghahn։ էջ 244։ ISBN 978-1-57181-293-3 . ↑ Rauschning Hermann (2006)։ Hitler Speaks: A Series of Political Conversations With Adolf Hitler on His Real Aims։ Kessinger։ էջեր 136–7։ ISBN 978-1-4286-0034-8 . ↑ Ericson Edward E III (May 1998)։ «Karl Schnurre and the Evolution of Nazi–Soviet Relations, 1936–1941»։ German Studies Review 21 (2): 263–83։ JSTOR 1432205։ doi:10.2307/1432205 . ↑ 18,0 18,1 Jurado Carlos Caballero, Bujeiro Ramiro (2006)։ The Condor Legion: German Troops in the Spanish Civil War։ Osprey։ էջեր 5–6։ ISBN 1-84176-899-5 . ↑ Lind Michael (2002)։ Vietnam, the Necessary War: A Reinterpretation of America's Most Disastrous Military Conflict։ Simon & Schuster։ էջ 59։ ISBN 978-0-684-87027-4 . ↑ Gerhard Weinberg (1970)։ The Foreign Policy of Hitler's Germany Diplomatic Revolution in Europe 1933–36։ Chicago: University of Chicago Press։ էջ 346 . ↑ Spector Robert Melvin։ World Without Civilization: Mass Murder and the Holocaust, History, and Analysis։ էջ 257 . ↑ «Hitler and Russia»։ The Times (London)։ June 24, 1941 . ↑ «Agreement concluded at between Germany, Great Britain, France and Italy»։ Munich: Yale։ 29 September 1938 (չաշխատող հղում). ↑ Beloff Max (Oct 1950)։ «Soviet Foreign Policy, 1929–41: Some Notes»։ Soviet Studies 2 (2): 123–37։ doi:10.1080/09668135008409773 . ↑ Collier Martin, Pedley Philip։ Germany, 1919–45 . ↑ Kinder Hermann, Hilgemann Werner (1978)։ The Anchor Atlas of World History II։ New York: Anchor Press, Doubleday։ էջ 165։ ISBN 0-385-13355-3 . ↑ Crozier Andrew J։ The Causes of the Second World War։ էջ 151 . ↑ Brown Robert J (2004-01-01)։ Manipulating the Ether: The Power of Broadcast Radio in Thirties America։ ISBN 0-7864-2066-9 . ↑ Roberts G (December 1997)։ «The Journal of Modern History» (review of Raack, R, Stalin's Drive to the West, 1938–1945: The Origins of the Cold War) 69 (4)։ էջ 787 . ↑ Hiden John (2003)։ The Baltic and the Outbreak of the Second World War։ Cambridge University Press։ էջ 46։ ISBN 0-521-53120-9 . ↑ Gromyko Andrei, Ponomarev B. N. Ponomarev (1981)։ Soviet foreign policy : 1917-1980 Collectible Soviet foreign policy : 1917-1980։ Progressive Publishers։ էջ 89 . ↑ Butler Susan (2016)։ Roosevelt and Stalin: Portrait of a Partnership։ Vintage Books։ էջ 173 . ↑ Bertriko Jean-Jacques, Subrenat A, Cousins David (2004)։ Estonia: Identity and Independence։ Rodopi։ էջ 131։ ISBN 90-420-0890-3 . ↑ Cienciala Anna M (2006) ։ «The Coming of the War and Eastern Europe in World War II» (lecture notes)։ University of Kansas . ↑ Murphy David E (2006)։ What Stalin Knew: The Enigma of Barbarossa։ Yale University Press։ էջ 23։ ISBN 0-300-11981-X . 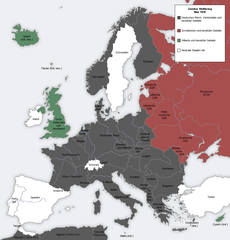 ↑ 77,0 77,1 77,2 77,3 77,4 «Text of the Nazi–Soviet Non-Aggression Pact»։ Fordham։ 23 August 1939 . ↑ Christie Kenneth (2002)։ Historical Injustice and Democratic Transition in Eastern Asia and Northern Europe: Ghosts at the Table of Democracy։ RoutledgeCurzon։ ISBN 0-7007-1599-1 . ↑ van Dijk Ruud, ed. (2008)։ Encyclopedia of the Cold War։ London։ էջ 597։ ISBN 978-0-415-97515-5 . ↑ Wegner Bernd, ed. (1997)։ From Peace to War: Germany, Soviet Russia and the World, 1939–1941։ Providence and Oxford: Berghahn։ էջ 507։ ISBN 978-1-57181-882-9 . ↑ Dębski Sławomir (2007)։ Między Berlinem a Moskwą. Stosunki niemiecko-sowieckie 1939–1941։ Warszawa: Polski Instytut Spraw Międzynarodowych։ ISBN 978-83-89607-08-9 . ↑ Dunn Dennis J (1998)։ Caught Between Roosevelt & Stalin: America's Ambassadors to Moscow։ University Press of Kentucky։ էջեր 124–5։ ISBN 0-8131-2023-3 . ↑ Sheen Fulton John (1948)։ Communism and the Conscience of the West։ Bobbs–Merrill։ էջ 115 . ↑ McDonough Frank։ Neville Chamberlain, Appeasement and the British Road to War։ էջ 86 . ↑ Garvin JL։ «German Atrocities in Poland»։ Free Europe։ էջ 15 . ↑ «Um Swiecie»։ ԼՀ։ Արխիվացված օրիգինալից-ից 2009-03-31-ին . ↑ Gilbert Martin (1990)։ The Holocaust։ Fontana։ էջեր 85–88։ ISBN 0-00-637194-9 . 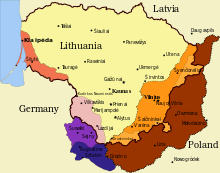 ↑ The German New Order in Poland: Part One։ Felsztyn (Tripod) . ↑ Zaloga Steven J (2002)։ Poland 1939։ Botley, UK: Osprey։ էջ 80 . ↑ Gross Jan Tomasz (2003)։ Revolution from Abroad։ Princeton: Princeton University Press։ էջ 396։ ISBN 0-691-09603-1 . ↑ «German–Soviet Boundary and Friendship Treaty»։ Yale . ↑ «Declaration of the Government of the German Reich and the Government of the USSR of September 28, 1939»։ Yale։ Արխիվացված օրիգինալից-ից November 26, 2005-ին . 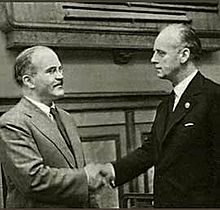 ↑ Domas Krivickas (Summer 1989)։ «The Molotov–Ribbentrop Pact of 1939: Legal and Political Consequences»։ Lituanus 34 (2)։ ISSN 0024-5089 . ↑ 121,0 121,1 Kennedy-Pipe Caroline (1995)։ Stalin's Cold War։ New York: Manchester University Press։ ISBN 0-7190-4201-1 . ↑ Mosier John (2004)։ The Blitzkrieg Myth: How Hitler and the Allies Misread the Strategic Realities of World War II։ HarperCollins։ էջ 88։ ISBN 0-06-000977-2 . ↑ «Obozy jenieckie żołnierzy polskich» [Prison camps for Polish soldiers] (Polish)։ ԼՀ: Internetowa encyklopedia PWN։ Վերցված է 28 November 2006 . ↑ «Edukacja Humanistyczna w wojsku»։ Dom wydawniczy Wojska Polskiego [Official publication of the Polish Army] (Polish) (1)։ PL։ 2005։ ISSN 1734-6584։ Արխիվացված օրիգինալից-ից 2008-03-07-ին . ↑ 130,0 130,1 Fischer Benjamin B (Winter 1999–2000)։ «The Katyn Controversy: Stalin's Killing Field»։ Studies in Intelligence (US: CIA) . ↑ Sanford George (2005)։ Katyn and the Soviet Massacre of 1940: Truth, Justice and Memory (Google Books)։ BASEES – Russian and East European studies: British Association for Soviet, Slavonic and East European Studies 20։ Routledge։ էջեր 20–24։ ISBN 978-0-415-33873-8 . ↑ «Excerpt from the minutes No. 13 of the Politburo of the Central Committee meeting, shooting order» (Russian, English)։ CA: Electronic museum։ March 5, 1940։ Արխիվացված օրիգինալից-ից 5 May 2008-ին։ Վերցված է 19 December 2005 . ↑ Senn Alfred Erich (2007)։ Lithuania 1940: Revolution from Above։ Amsterdam, New York: Rodopi։ ISBN 978-90-420-2225-6 . ↑ Pogonowski Iwo (1998)։ Jews in Poland։ Hippocrene։ էջ 101։ ISBN 0-7818-0604-6 . ↑ 141,0 141,1 141,2 141,3 141,4 «USHMM» . ↑ Wardzyńska Maria (2009)։ Był rok 1939 Operacja niemieckiej policji bezpieczeństwa w Polsce. Intelligenzaktion (Polish)։ IPN Instytut Pamięci Narodowej։ ISBN 978-83-7629-063-8 . ↑ Meier Anna։ Die Intelligenzaktion: Die Vernichtung Der Polnischen Oberschicht Im Gau Danzig-Westpreusen։ VDM Verlag Dr. Müller։ ISBN 978-3-639-04721-9 . ↑ Zamoyski Adam (1989)։ The Polish Way։ John Murray։ էջ 358։ ISBN 0-7195-4674-5 . ↑ 150,0 150,1 150,2 «Nazi German Camps on Polish Soil During World War II»։ PL: MSZ . ↑ Berenbaum Michael (2006)։ «The World Must Know»։ United States Holocaust Memorial Museum։ էջ 114 . ↑ «Deportations to and from the Warsaw Ghetto»։ US: Holocaust Memorial Museum . ↑ Harmon Brian, Drobnicki John։ «Historical sources and the Auschwitz death toll estimates»։ Techniques of denial։ The Nizkor Project . ↑ Piper Franciszek, Meyer Fritjof (2002)։ «Die Zahl der Opfer von Auschwitz. Neue Erkentnisse durch neue Archivfunde»։ Osteuropa (review article) (German) (PL: Auschwitz)։ 52, Jg (5): 631–41։ Արխիվացված օրիգինալից-ից 2011-05-21-ին . ↑ Vladimir Beshanov (2008)։ Czerwony Blitzkrieg (Polish)։ PL: Inicjał։ էջեր 250–62։ ISBN 978-83-926205-2-5 . ↑ 160,0 160,1 Wasserstein Bernard (2007)։ Barbarism and Civilization: A History of Europe in Our Time։ Oxford University Press։ էջ 305։ ISBN 0-19-873074-8 . ↑ «Represje 1939–41 Aresztowani na Kresach Wschodnich» [Repressions 1939–41. Arrested on the Eastern Borderlands] (Polish)։ PL: Ośrodek Karta։ Արխիվացված օրիգինալից-ից 10 December 2006-ին։ Վերցված է 15 November 2006 . ↑ 164,0 164,1 164,2 Johari JC (2000)։ Soviet Diplomacy 1925–41։ 1925–27։ Anmol։ էջեր 134–7։ ISBN 81-7488-491-2 . ↑ 167,0 167,1 167,2 167,3 Cohen Yohanon (1989)։ Small Nations in Times of Crisis and Confrontation։ SUNY Press։ էջ 110։ ISBN 0-7914-0018-2 . ↑ «From the Red Flag to the Union Jack»։ What next journal (UK) . ↑ Kennan George (1961)։ Russian and the West, under Lenin and Stalin։ NY: Mentor։ էջեր 318–9 . 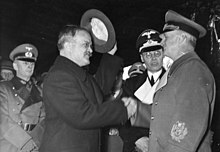 ↑ Cartier Raymond (1962)։ Hitler et ses Généreaux [Hitler and his Generals] (French)։ Paris: J'ai Lu/A. Faiard։ էջ 233 . ↑ Sontag RJ, Beddie JS, eds. 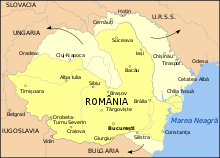 (1948)։ Nazi–Soviet Relations 1939–1941։ Washington, DC: State Department։ էջ 151 . ↑ Weeks Albert L (2003)։ Stalin's Other War: Soviet Grand Strategy, 1939–1941։ Rowman & Littlefield։ էջեր 74–5։ ISBN 0-7425-2192-3 . ↑ 195,0 195,1 Dreifeilds Juris (1996)։ Latvia in Transition։ Cambridge University Press։ էջեր 34–5։ ISBN 0-521-55537-X . ↑ «Record Group 84, POLAD, Classified General Correspondence, 1945–49»։ National Archives and Record Administration։ Box 100. [Archive] Location 350/57/18/02 . ↑ Taubert Fritz (2003)։ The Myth of Munich։ Oldenbourg Wissenschaftsverlag։ էջ 318։ ISBN 3-486-56673-3 . ↑ Henig Ruth Beatrice (2005)։ The Origins of the Second World War, 1933–41։ Routledge։ էջեր 67–68։ ISBN 0-415-33262-1 . ↑ Ведомости Съезда народных депутатов СССР и Верховного Совета СССР (text of the declaration) (Russian) (29)։ ՌՈՒ: Law mix։ 1989։ Ст. 579 . ↑ Borejsza Jerzy W, Ziemer Klaus, Hułas Magdalena (2006)։ Totalitarian and Authoritarian Regimes in Europe։ Berghahn։ էջ 521 . ↑ Tom Parfitt (2014-11-06)։ «Vladimir Putin says there was nothing wrong with Soviet Union's pact with Adolf Hitler's Nazi Germany»։ Telegraph։ Վերցված է 2014-11-06 "The Russian president made the comments at a meeting with young historians in Moscow, during which he urged them to examine the lead-up to the war, among other subjects." - how does Parfitt know that ? Which young historicans ? Where in Moscow ? ↑ Salmon Patrick (2002)։ Scandinavia and the Great Powers 1890–1940։ Cambridge University Press . ↑ Israėli︠ Viktor Levonovich (2003)։ On the Battlefields of the Cold War: A Soviet Ambassador's Confession։ Penn State Press։ էջ 10։ ISBN 0-271-02297-3 . ↑ 218,0 218,1 Herf Jeffrey (2006)։ The Jewish Enemy: Nazi Propaganda During World War II and the Holocaust։ Harvard University Press։ էջեր 97–98։ ISBN 0-674-02175-4 . ↑ Osborn Patrick R (2000)։ Operation Pike: Britain Versus the Soviet Union, 1939–1941։ Greenwood։ էջ xix։ ISBN 0-313-31368-7 . ↑ Gorodetsky Gabriel (1994)։ Soviet Foreign Policy, 1917–1991: A Retrospective։ Routledge։ էջ 55։ ISBN 0-7146-4506-0 .